This is the first in a series of posts about bière de coupage (previous posts on the subject can be found here). 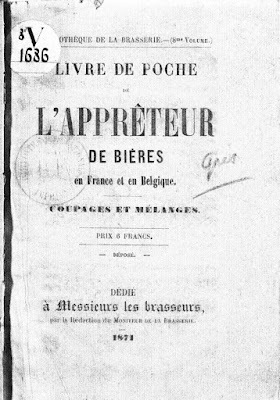 In this first post I'll be looking at some of the background and history behind the idea of bière de coupage, focusing in particular on some of what I've learnt from going through some old French brewing texts, particularly Auguste Laurent's 1871 monograph Livre de poche de l'appreteur de bieres en France et en Belgique: Coupages et Melanges, and Georges Lacambre's 1851 treatise on brewing and distilling. 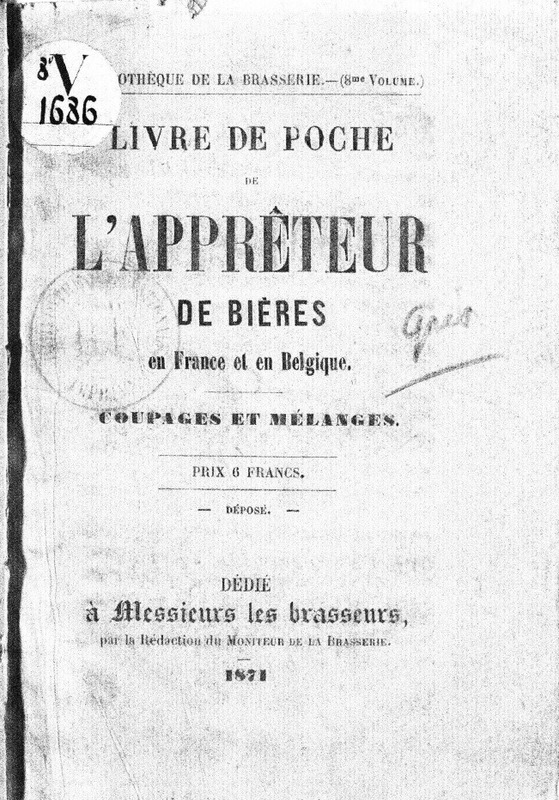 My aim in working through these texts was to find out a bit more about the practice of blending lambic or other kinds of aged beer with younger beers such as saisons, a practice that is described by Yvan de Baets in his essay on the history of saison, and that survives today in beers like Birra Del Borgo's Duchessic, De Ranke's Cuvee De Ranke, or Jester King's Das Wunderkind. The second post in this series will look at those beers, along with other contemporary examples of bière de coupage, and include information about the processes and practices employed by brewers making them. The remaining posts in the series will be about my own experiences making bières de coupage at home. Two quick notes before I begin this post. First, my reading knowledge of French is shaky at best. Knowing a bit about brewing helped, but there were times when I could not work out what was going on, even with the help of an online translator. I've tried to only include information I was fairly certain about, but I may still have made mistakes. Second, the texts I am relying on are among Yvan de Baets' sources for his essay, and when I contacted Yvan for help in locating these texts, and he warned me that Laurent's text in particular was often contradictory and unreliable. Yvan himself put a great deal of research into that chapter of Farmhouse Ales, sifting through what scant and scattered evidence there is about French and Belgian farmhouse brewing to form a general picture that allowed him to assess the veracity of particular sources. I haven't done a fraction of that work, so I am not in a position to make the same kind of judgements. Again, I've tried to keep that in mind when repeating claims made by Laurent and others. 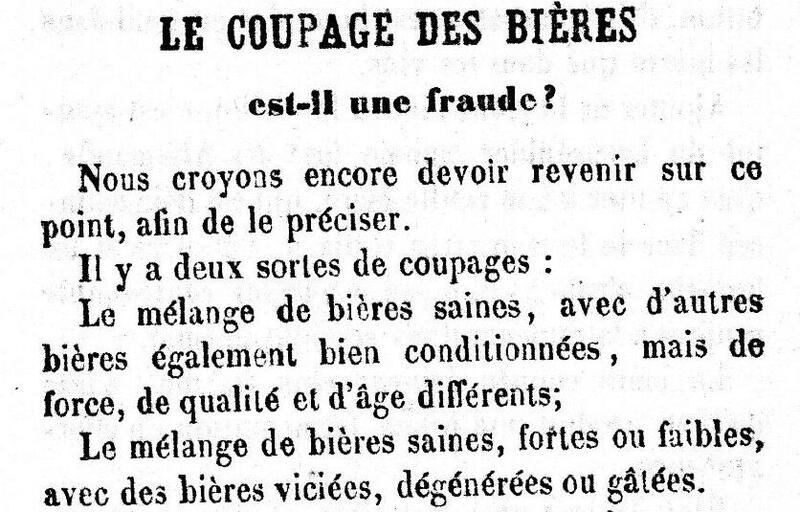 So what is bière de coupage? When the name shows up in the historical literature, it works by a sort of metonymy, serving as the name for any beer that was made with a particular process (in this case, blending). The same is true of bière de garde, which doesn't really refer to a distinct style of beer in the way we might think of it, but to any beer intended for long term storage. Laurent will happily use the phrase bière de garde in comparing beers from Northern France and Bavaria, in a context where it is clear that the beers in question were very different. 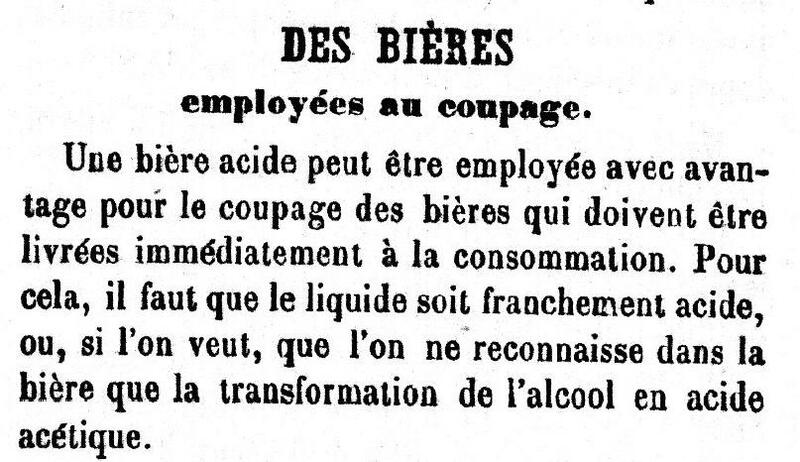 (Of course, bière de gardes from a particular regions might all bear certain stylistic similarities to each other.) 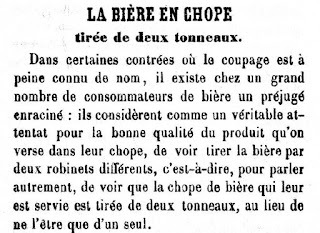 So just as a bière de garde is a beer that underwent some ageing before sale, we might think of bière de coupage as a name for beer that was blended at some point before it was sold. In this sense, the name is appropriate for many diverse 'styles' of beer, including the lambics of the Pajottenland, the red and brown ales of Flanders, and the historic porters made in London. Recently people (including me) have started using the phrase to refer to saisons made by blending aged sour beer with younger beer, a characterization that can be stretched to fit most (though not all) of the commercial lambic/non-lambic blends listed here. These certainly fit the broader category of bières de coupage, but (as with all things saison) there is very little information about such beers in the historical brewing literature. 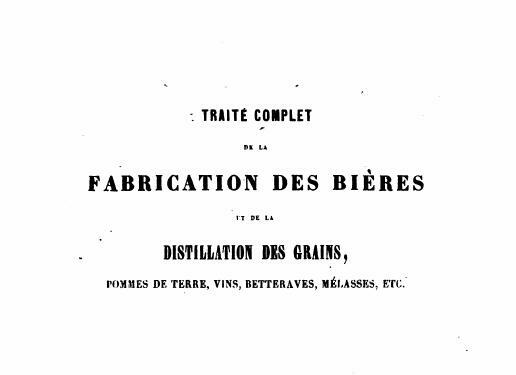 Lacambre, Laurent, and the other authors I looked at are all concerned with industrial brewing. As Yvan de Baets put it, "no-one among the scholars at that time cared for a beer made by farmers". However, that doesn't mean that we can't learn anything interesting from looking at when and why historical brewers relied on blending. There is at least some chance that the kinds of beer brewed at commercial breweries in Belgium and Northern France grew out of local farmhouse traditions, and modern brewers who blend lambic in with their non-lambic beers are following a tradition of industrial brewing that goes back to the beers described by Laurent and co. When I asked Nino Bacelle from De Ranke about the historical background to their Cuvee De Ranke, he mentioned the practices of 18th century porter brewers, along with the blending traditions that survive in Belgium: lambics in the Pajottenland, and the red and brown ales like Rodenbach from Roeselare/Kortrijk, or Liefmans from Oudenaarde. Coupage, then, refers to a process of blending. In the best case, this is a matter of blending aged beer with younger beer, but historically at least the idea of 'blending' also covered the use of sugar syrups and acids such as tartaric or even vinegar to modify the flavour profile of a beer. Laurent covers all of this. Again, in the best case the aged beer was intended for ageing and lacking any pronounced flaws, though the practice of cutting beers was disreputable in some circles, since brewers would use it as a way to get rid of bad stock or old beers returned by vendors. Although Laurent emphasizes the fact that blending is uncontroversial and expected in many places, he still feels a need to spend a good portion of his book defending it. Whatever the historical origins of this practice, it was perfected on a large scale by the porter brewers of London in the 18th and 19th centuries. The quality of this beer came from long-term ageing in large oak vats, where it would undergo a secondary fermentation that we now know would have involved both brettanomyces and lactic-acid producing bacteria. The result was a tart, vinous beer, often blended at serving with younger beer according to the customers' preferences. Interestingly, while the practice died out in England towards the end of the nineteenth century, it seems to have persisted for some time in Ireland, to the point where English brewers were again considering ageing a portion of their beers to imitate the Irish taste. I don't think anyone really knows the original connection between the porter brewers of England and the red and brown sour ales of Belgium. Alexander Rodenbach certainly spent some time in English breweries, and the story of him taking the practice of 'vatting' ales back to Belgium with him is an enjoyable one, though I suspect the tradition of brewing such beers predated his innovations. (One thing he might have learnt in England was the superior quality of beers aged in large vats as opposed to small casks, something English brewers understood to be one of the most important technical developments in brewing porter.) 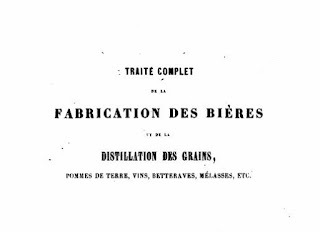 Whatever the truth of that story, by the time Lacambre and Laurent were writing their treatises in the late 19th century, blending of old and young beer was a common (though occasionally disreputable) practice. Describing barley beers from the regions around Antwerp, Lacambre states that they age well for several years, and are rarely consumed pure "because we are in the habit, as is the practice with so many beers in Belgium, of cutting them with beers of the same type that are younger and fresher". (p.305) He says the same thing about double uytzet, a bière de garde brewed in the region around Flanders. In his treatise on blending, Laurent tends to focus on lambic, bière de mars, and faro from the Pajottenland. This is unsurprising, since part of his purpose is to recommend the practice of blending to brewers who are leery of it, and one way he does this is by showing is that it is uncontroversially part of certain brewing cultures. He opens his book by describing the mix of brewers and blenders to be found around Brussels, and returns repeatedly to the production of faro from lambic and bière de mars as a good example of what can be achieved by blending. One reason Laurent uses faro as his example is that there seem to have been different approaches to its production. The beer itself was a blend of lambic and bière de mars, both typically products of the same mash, with the wort for lambic consisting of the first runnings, and the wort for biere de mars coming from the last. Laurent describes various approaches to making faro: some brewers seem to have blended the worts prior to fermentation, while others let them ferment separately and then recombined them in a single tank. Much more common was the practice employed by merchants who purchased lambic for resale: blending the two beers prior to serving, or in the glass, typically using younger bière de mars and sugar syrup as well. Laurent describes how different establishments would each have their own distinct version of such beers, made using blending ratios that were a carefully guarded secret. The picture that emerges from Laurent's descriptions of Lambic culture around Brussels involves a mix of both breweries and independent merchants who purchased lambic from the brewers. Laurent suggests that the latter had various financial advantages over the lambic breweries, since they did not have to invest capital in a brewhouse system. 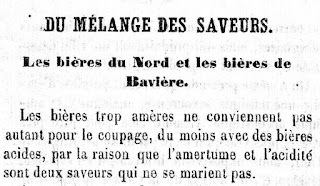 There is no explicit mention of these merchants blending lambic with other kinds of beer besides bière de mars, though Laurent does mention in passing an old practice of blending in some brown beer, or beer boiled with lime, to give colour to lambic (though he also suggests that the latter was considered bad practice by the time he was writing). But at the very least we know that lambic was sold and purchased for the purpose of blending, so it is presumably at least possible that these merchants purchased and blended in other kinds of beer as well. This brings us to the primary motivation behind blending: achieving a particular flavour profile that will be pleasing to the consumer. This is the virtue Laurent stresses most frequently when describing the process. In fact, for me, the most interesting parts of his book were where he described the distinctive taste desired by drinkers in northern France and Belgium: la vinosité. This is partly a matter of the aromas of aged beer (particularly, I would suspect, those that are produced by brettanomyces), but Laurent also describes it as a certain kind of balance, with a bitterness that does not dominate the beer, and a slight tartness that does not undermine its overall quality. In fact Laurent states more than once that a touch of acidity was both desirable and expected in both bières du Nord and faro. Obviously if you're aiming for a delicate balance of bitterness and acidity, its going to be easier to produce a consistent product if you have various beers available for blending, and this is exactly how Laurent describes the brewers of bière du Nord vineuse. A bière de garde that has become tart can be blended with a younger beer, the latter providing a mellowness that complements the aromas and acidity of its older counterpart, while also aiding in head retention and carbonation. 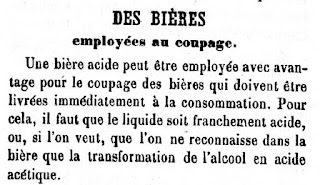 It is interesting to see Laurent also emphasize that while an acid beer can be an excellent component for coupage, one should not use beer that is too acetic or otherwise marked by poor fermentation. Laurent points out other virtues of blending as well. One thing that comes up repeatedly in most brewing books I've looked at from this period is the way in which the seasons affected what the brewer could produce. Summer in particular seems to have been a difficult time to make good beer. One practice that Laurent recommends, apparently common in brewers of 'ordinary brown beers' around France and Belgium, is blending some aged beer in with the newly fermenting wort in the summer. English brewers did something along the same lines, calling it 'breaking in'. This helped the beer along its way, presumably staving off less desirable organisms as the populations from the older beer took control. In fact, the planned time between blending and consumption would sometimes dictate the proportions of the blend. Laurent suggests that porter brewed in spring and intended for consumption that summer was blended differently from porter intended for longer ageing, though from what I can understand the proportions he describes in both cases are the same, one part old beer to three parts young, or 9 gallons of old in a 36 gallon barrel. Laurent states a preference for beers blended and allowed to referment prior to consumption, since it allows the qualities of the various beers to meld with each other, but he also spends some time describing beers that were blended at serving. As I mentioned above, this was common with porter and some versions of faro, but Laurent also mentions a drink he calls half-en-half, a blend of equal parts lambic and faro, or in England, porter and ale (apparently in 1930s America 'half and half' referred to a blend of stock ale and pilsner.). Dave Janssen tells me that Jean van Roy served him a half-en-half of Rose de Gambrinus and Fou Foune at Cantillon, so clearly the practice survives today. In general, then, coupage is just blending, but typically refers to a once common practice of blending old and young beers together, the aim of which was to combine the best characteristics of each beer, particularly the tartness and aromatic complexity of an aged ale, and the mellow smoothness and improved head retention of a younger beer. 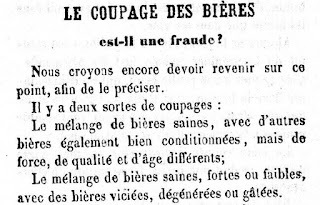 Bière de coupage is a handy name for any beer made in this way, and would be particularly appropriate for any beer whose character depended on the combination of features of old and young beer. Nothing I've written in this post pertains solely to the combination of saison and lambic/sour beer in particular, and none of the authors I looked at discuss anything in these terms. However, it should be clear that if one's aim were to achieve a combination of the properties of lambic and young saison, the general considerations outlined by these authors would apply in this case too. Moreover, Laurent's description of the vinous profile associated with the beers of northern France and Belgium suggests that such a combination would have been desirable to brewers and consumers in this region, and his description of the culture around Brussels makes it clear that it was possible to purchase lambic for the purpose of such blending. In the next post in this series, I'll be looking at contemporary beers made in this way, including some details of the brewing process employed by their producers. The remaining posts in the series will focus on brewing bières de coupage as a homebrewer. Great writing and fantastic introduction to this awesome topic. I look forward to reading more. Thanks for sharing! sounds very interesting, actually i'm fermenting a golden sour to use for blending with some of my saisons to give them complexity, but didn't know obut the biere de coupage thing. Now this make me think, under this definition Gueuze are Biere de Coupage because are blends of old and young beer, but a sour ale blended from the same batch (or at least year) only different barrels is just a blended beer am i right? I think the name fits either, its just that Laurent focuses more on blending of beer of different ages, because that was the more common practice. As for gueuze, it certainly fits the description! I'd speculate that one of the reasons that Laurent doesn't talk about it much is that it is probably a relatively recent development in lambic brewing (from a long term perspective anyway), dependent on wide-spread use of glass bottles, that was not well established when he was writing. 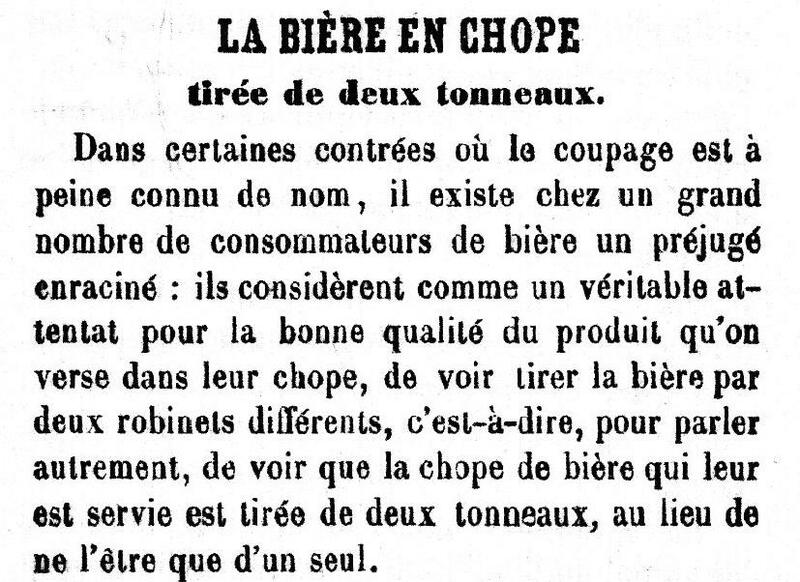 Yeah Amos, I think you're right about the reasons gueuze isn't discussed with coupage. This publication date is right around when the term 'Gueuze' shows up for blended carbonated lambic. 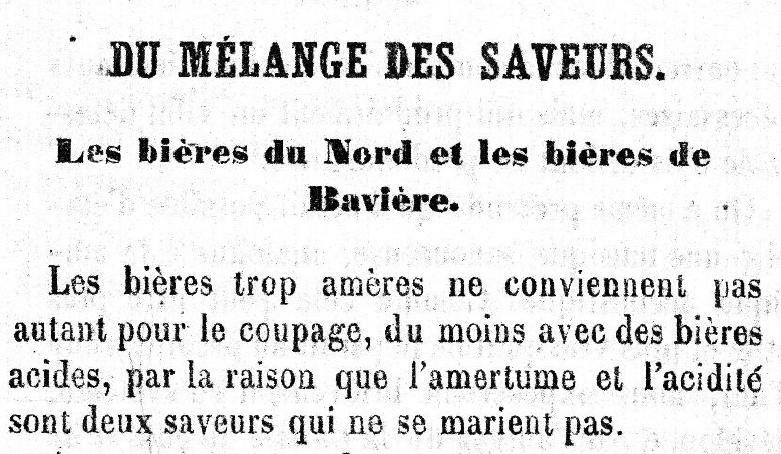 Gueuze is not in Lacambre (1851) which spends a good bit of time talking about lambic. Lambic.info cites Guinard saying that 1870 is a first mention of it (http://www.lambic.info/The_Language_of_Lambic) and I've heard Jean from Cantillon say that the term shows up at the end of the 19th century. Great post Amos, looking forward to the rest for the series.